The Smith & Wesson SD9 VE is a well made, budget pistol. It’s inexpensive to buy and inexpensive to run. They made this one an all around good gun. It’s good for fun on the range, open or concealed carry, or even for having an extra firearm in the house. This is a really good gun for first time users. It may be a little on the heavy side for summer time, shorts, undershirt, and flip flop weather, but for any other time you can carry this concealed with a light jacket or sweatshirt. Thinking of carrying this gun is probably what has made you start wondering what the best holster is for the Smith & Wesson SD9 VE. I’ve done some research am I found the Blackhawk SERPA Sportster to be the best around. It was designed for civilian carry or range use, but it still has their famous SERPA design. It’s a paddle mount and made of durable polymer. If you’re looking for a strong, reliable, and safe holster you can’t go wrong with this one. We’ll take a closer look at each one to help you make your choice. The pancake holster design is about 60 years old. It was designed to be worn close to the body on either the strong side or cross draw style, and have two or three belt slots. For comfort, the larger your midsection, the better you will like the pancake holster. How you wear your pants determines comfort, as well. If you wear you pants low on your hip it will cause the holster to ride vertical. If you wear your pants a bit higher your holster will be pulled in closer to your body. This helps with concealment. A good pancake holster holds the gun tight against your body. Paddle holsters are easy on and easy off. This is one of the nicest feature of a paddle holster. A paddle, or duckbill is attached to the back of the holster. The paddle is slid down over the waistband of your pants, pinching it between the holster and the paddle. They are comfortable to wear, unless you have a bigger midsection. The ease of their on and off ability is also their biggest downfall. Since they are easy to take off the belt, gun grab could happen in a struggle. 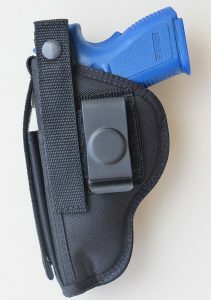 Belt clip holsters can be either outside the waistband (OWB) or inside the waistband (IWB). They usually have a metal clip that clips onto your belt. Some will have belt slides along with a clip for security. Usually made from either leather or nylon, they can come with or without thumb straps. Hybrid holsters have become very popular over the last several years. Hybrids combine polymer or kydex with leather. The pocket the gun sits in is made of hard plastic and the part that sits up against your body is soft leather. Several companies make a “tuckable” hybrid, meaning they can be concealed beneath a tucked in shirt. A belly band is simply a large elastic band that goes around your midsection, and is secured by Velcro. They have pockets that you can insert a gun and spare magazine into. Belly bands are great for times that you may not have a belt to secure a hip holster to. Maybe as you jog in the morning and wear sweats so other types of holsters won’t work. The belly band is considered deep concealment. One thing to keep in mind is the deeper the concealment, the harder it will be to get to your gun. Shoulder holsters are not just for vice squad police officers who wear pastel t-shirts under a white jacket with white slacks. Remember Miami Vice? No matter how you feel about that show, the shoulder holster became a cultural icon and the rig Don Johnson wore became known as the Miami Classic. If you wear a shirt, tie and sportcoat, a shoulder holster is a great set up for you. The harnesses go around each shoulder and your gun sits under one arm and extra magazines sit under the other, to balance out weight. A shoulder holster may not work for your attire or climate. OWB or IWB may not be comfortable for you. Whatever the reasons are, a lot of people are turning to pocket carry as their everyday concealed carry option. Pocket holsters are best for compact and subcompact pistols and revolvers, yet some people carry a full size weapon in their pocket. They can fit in the front or rear pants pocket and even a jacket pocket. They conceal very well and are very convenient. What could be easier than putting your gun in a holster and slipping it into your pocket? Ankle carry, is usually for a backup firearm and one of smaller size. They are made from material similar to belly bands. Carrying on the ankle means you will be walking around with extra weight on one ankle. You will need loose fitting pants and it will take extra time to draw. Someone who spends time at a desk or in a car may like an ankle holster. Keep in mind that when you sit you have to watch for your pant leg to hike up and expose your gun. 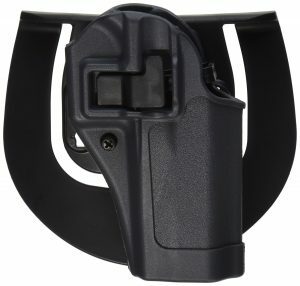 As with all SERPA holsters, this holster has an audible click when you holster it. This lets you know the gun is secure. It’s still a smooth draw with the release button that you naturally push in the draw position. 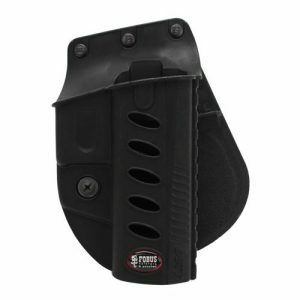 This holster combines the ruggedness and stability of a belt holster with the convenience of a clip on. It has a polyslide sight channel, soft nylon lining, reinforced thumb strap, and a moisture resistant outside. The Fobus holster is maintenance free. There’s no need to oil it, it can be washed out with soap and water, and it doesn’t sweat. 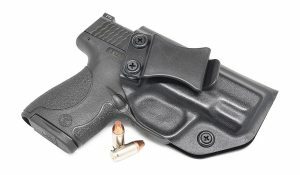 This IWB holster is designed with comfort and security in mind. It is worn inside the waistband and needs a long shirt to conceal. There is a reason why experienced gun users joke about a drawer full of holsters. There are different holsters types for different occasions, some holsters just won’t’ be comfortable for you and some just aren’t well made. With all the different types of holsters to choose from, different brands of holsters, and mixed reviews about each one, it can be quite a process to find a good holster. I think that may be something to keep in mind. It’s a journey and you will find the right one for you. At the end of all the research I did, I feel the best holster for the Smith & Wesson SD9 VE is the Blackhawk SERPA Sportster. It offers some of the best features and Blackhawk is a reputable company who will stand behind their product. What model number of Serpa Sportster Holster? I have been looking all over for this “detailed information”, and no one seems to be able to provide it. If you can provide a Serpa model number to fit the S&W SD9VE, I would greatly appreciate it. I was looking for the same info did you ever find out model number?